Amy Cuddy: Your body language may shape who you are No two ways about it: Social psychologist Amy Cuddy’s talk from TEDGlobal 2012 touched a nerve, and sparked a sensation. In the talk, “Your body language shapes who you are,” Cuddy offered a free, low-tech life hack: assume a posture for just two minutes — and change your life. The idea caught on, the talk has now been viewed more than nine million times, and the idea of “power posing” has truly entered the vernacular. For the visualization below, created in conjunction with Brazilian magazine Superinteressante, the designers illustrated some of the points Cuddy makes about posture and its impact on how we feel. Take a look … and stand up straight. Amy Cuddy also appears in the latest episode of NPR’s TED Radio Hour, “Spoken and Unspoken,” about the ways human beings communicate in both intentional and unintentional ways. Take a listen! “Fake it ’til you make it” is also called “act as if” means to imitate confidence so that as the confidence produces success, it will generate real confidence. 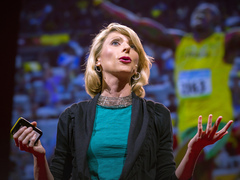 Listen to the very interesting talk by Social psychologist Amy Cuddy’s talk from TEDGlobal 2012. In her talk she explains how “Your body language shapes who you are,” . Don’t miss it. Reblogged this on Perceptions . Power posing: how to look and feel more confident.